The black bullhead, Ameiurus melas, is one of two species of bullhead catfishes in Utah. The black bullhead is native to areas east of the Rocky Mountains in the United States, southern Canada, and northern Mexico. It has become established, however, in many of Utah's warm waters, where it is now a popular sport fish. 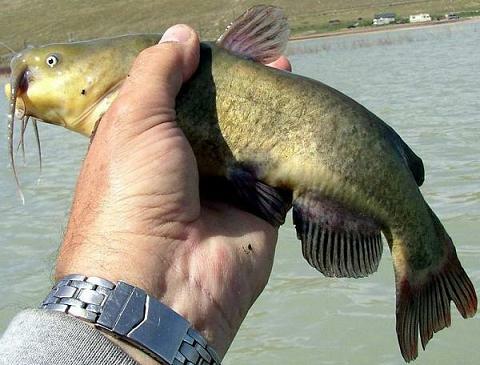 The black bullhead is especially common in Utah Lake. The black bullhead is an opportunistic bottom-feeder, eating fishes, many types of invertebrates, plant matter, and detritus. The species spawns from late spring to early summer; nests and young are guarded by parents. The black bullhead prefers the warm, slow-moving, turbid habitat provided by small water bodies and backwaters. Adult Black Bullhead Catfish are blackish, dark olive, or dark brown on the back. The belly is greenish-white or bright yellow. They do not grow to the tremendous size of some other catfish species, usually not growing more than a couple of pounds, but they can be very fun to catch, especially for kids or beginner fishermen or fisherwomen. Black Bullhead caught at Utah Lake. Although bullhead catfish will occasionally hit lures, the most common way to fish for them is by using bait. Bullheads will readily take a nightcrawler fished on the bottom. They will also occasionally bite on small chunks of minnow or other fish meat for bait. 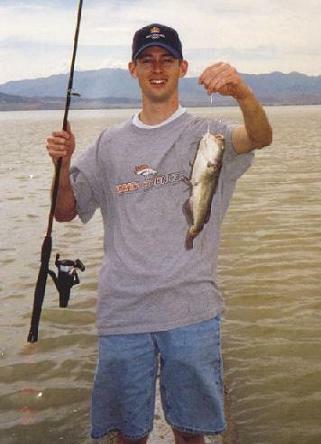 Carp meat is a good choice, and on Utah Lake, you can also use white bass meat for bait. By far, the best bait for 'mudcats' as they are commonly known, is the regular old earthworm. One of the best ways to rig up to fish for bullhead is to cast out with just a worm on your hook and no weight or sinker of any kind. This lets the bait settle naturally on the bottom. Sinkers are often used to enable casting farther distances, or to get the bait to sink faster, however with bullhead this is usually unnecessary. Bullhead can be caught from very close to shore, which makes them a good fish for kids to catch. A nice bullhead caught at Utah Lake. Another good method for catching bullhead is to use a bobber a few feet above the hook. This allows the bait to suspend slightly above the bottom of the lake, allowing the bait to be more easily seen by catfish and other species as well. Utah Lake is by far the best place to go fishing for bullheads. Take a kid along and enjoy!